I'll be adding more teams ready for next season, but if you want to make sure that you can get updates on Twitter of your team's results, feel free to email me (phawksworth [at] gmail [dot] com) and push your team to the top of my todo list. I'm also readying MLB Results to provide Major League Baseball results. MLB Results will be active very soon. As with the NBA teams, please poke me if you want to get updates for your team and I'll be sure to create their account. The code which drives this, is my first outing into the world of Python. You can find the code here. Feel free to take it and use it as you wish. I also welcome feedback and suggestions on the code, please be gentle though, as I said, this is my first time playing with Python. 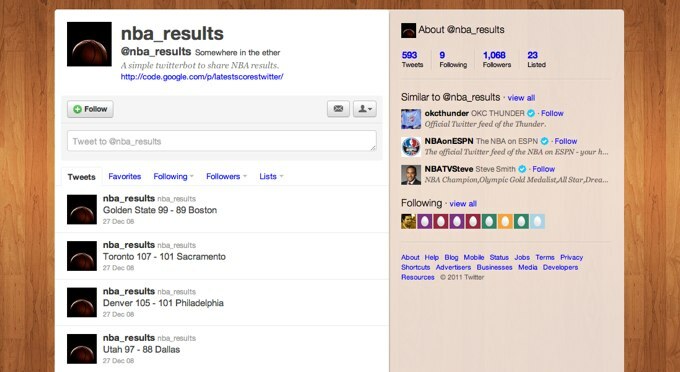 Many thanks to the nice folks at Carsonified for permission to use their site's background image on NBA Results. Thanks also to Balakov who published the image used for each NBA team twitter account icon under a Creative Commons license on flickr.